Launched with a super early bird pricing of just US$99 on Kickstarter, the Ticwatch E seemed too good to be true. At that price, you got yourself a full functioning Wear OS smartwatch with Wi-Fi, GPS and a heart rate monitor, plus 4GB of internal storage for you to load up your favourite tracks should you decide to go for a run without your phone. I took the plunge at US$119 (the US$99 price was sold out by the time I decided) and as it turns out, it lived up to its expectations and then more. 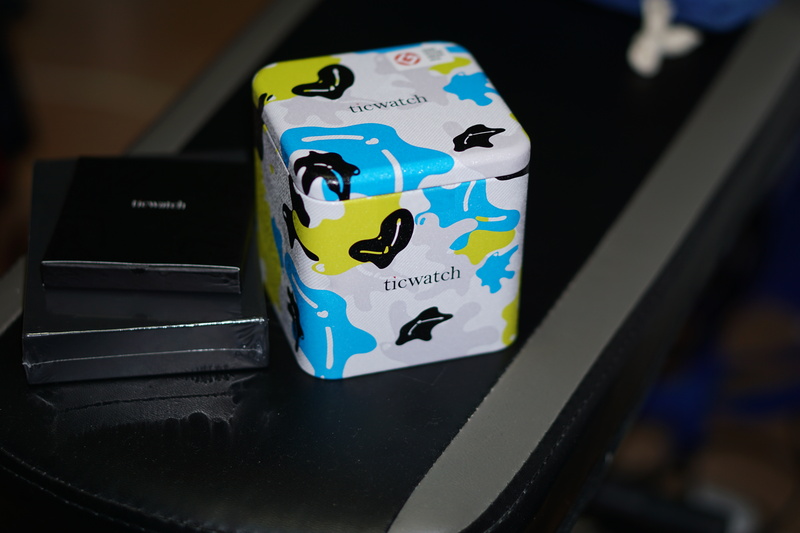 The Ticwatch E comes in a metal tin case with a quirky design resembling that on milk cartons. Apart from the watch itself and a magnetic charging cable, there's nothing else of note within the case. For Kickstarter backers, you get an additional charging cable as well as a tempered glass screen protector. The watch's design, especially in the 'Shadow' colourway, is especially nondescript and doesn't scream "smartwatch" to you right away. From a distance, perhaps the only telling detail that the Ticwatch E is no typical wristwatch is the fact that its crown button lies on the left of the watch. The watch itself is not heavy and certainly lighter than most metal-bodied wristwatches. 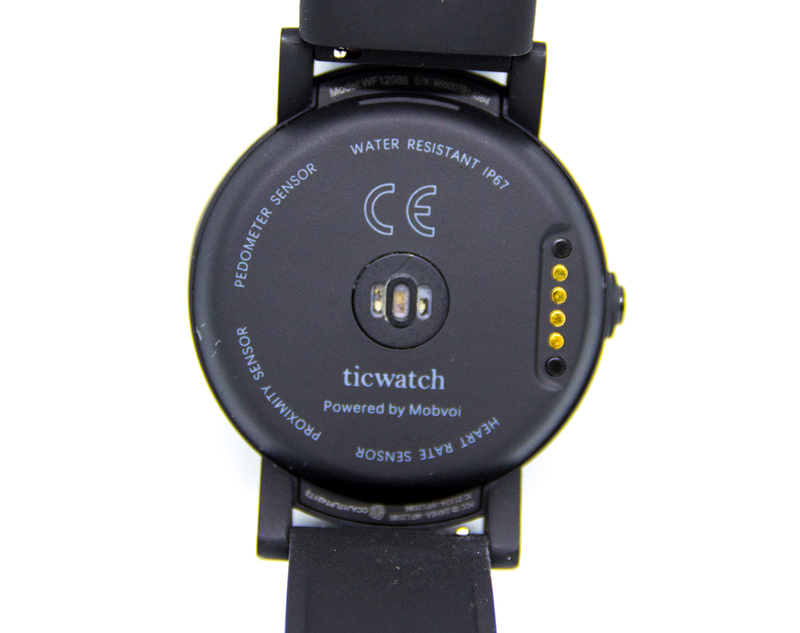 Unlike the Ticwatch S, the bands are easily replaceable here. There's also no 'flat tyre' as with the Moto 360, so watch faces with round designs can be displayed in their full glory. The screen itself is an OLED display with 400×400 resolution that looks reasonably sharp. While blacks are truly black as you would expect on an OLED display, the screen unfortunately exhibits a minor banding issue which is noticeable on a grey background. Still, this is a very minor issue considering you won't be viewing photos or watching videos on your watch. OLEDs are rather susceptible to burn-in, so as a precautionary measure, I disabled the "always-on display" functionality of the watch and instead set it to light up only when I flick my wrist. Unfortunately, the watch often lags for a second or two before lighting up, which was annoying at first (I've since gotten used to it). Apart from this flaw, performance when navigating around menus and apps is generally good. The back of the watch is equally unassuming. There's a heart rate sensor in the middle which lights up in green when in use, as well as the charging pins towards the left of the watch. 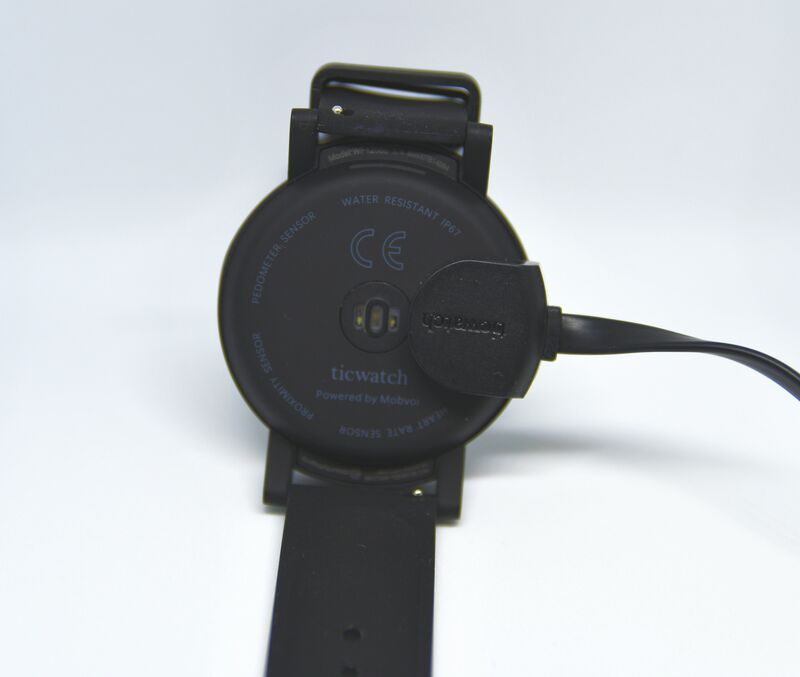 Charging the Ticwatch E is a painless affair, as there are two small magnets on the side of the charging pins to guide the charging cable to the correct spot. There's also a charging dock available as an optional accessory. Charging takes about 45 minutes to fully charge the watch. Battery life on this watch is not exceptional, but decent. It can last between one and one-and-a-half days depending on usage, which means you'll do just fine even if you left your charging cable at home. The watch's greatest gift is that it runs on Wear OS by Google (formerly known as Android Wear), which is basically the equivalent of Apple's watchOS for Android phones. It fulfils the three basic use cases for a smartwatch–fitness, sleep tracking and navigation. On the fitness front, most fitness apps available for Android have companion apps available for Wear OS, including Google Fit and RunKeeper (which I highly recommend). The Ticwatch E itself comes preloaded with a fitness app, which I found rather rudimentary and promptly disabled. Sleep tracking is available in the form of Sleep as Android, a paid app which, amongst others, measures your sleep cycles and gently wakes you up in your lighest sleep phase. Meanwhile, Google Maps works pretty well on the Ticwatch E, allowing you to see where you're headed towards without looking at your phone. Another app that works really well on the Ticwatch E is CityMapper, which is even able to tell you when to alight from your bus. SG BusLeh! 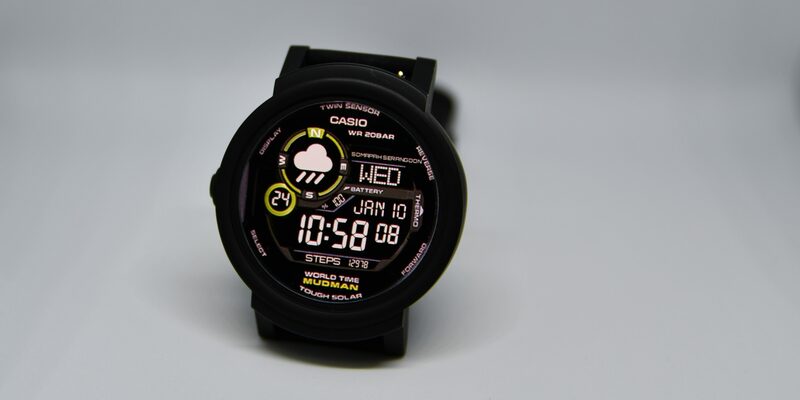 also has a Wear OS companion which is available if you pay the yearly subscription of $0.99. In all, the Ticwatch E makes for a very compelling smartwatch choice. Apart from the lack of NFC and a 4G option, it has just about everything you could ask for in a contemporary smartwatch. With street prices under $250 (check Lazada, Qoo10 or Carousell), it's perhaps the best smartwatch you can buy for the money.